The great majority of tonearms pivot from a fixed point on the plinth. The stylus describes an arc across the record that (assuming proper cartridge alignment) kept it nearly, though not perfectly, tangent to the groove at all points. Achieving perfect stylus/groove tangency at all times would seem an obvious advantage in retrieving the most music from the groove. This is exactly what straight-line tracking (SLT) arms are supposed to do. 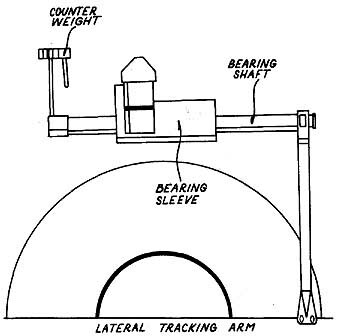 In contrast to an arm that pivots across the record and describes an arc with the stylus, instead the entire arm and stylus travel together in a straight line across the radius of the LP. Record-cutting lathes use an SLT arm so, theoretically at least, “uncutting” the record the same way it was cut would seem to offer potential major advantages. The idea of a linear tracking arm always parallel to the groove has intrigued designers for many years. In fact, Edison’s early gramophones had all linear tracking designs. But while many SLT designs have been attempted, the vast majority have been unsuccessful. Currently, there are three great leaders—the Souther, the Eminent Technology, and the Goldmund arms. Stylus/groove tangency may be improved greatly with SLT arms, but in the real world they still remain far from perfect. For one thing, the stylus may not be perfectly aligned when manufactured, or the cartridge perfectly mounted in the arm. Even if all begins well, perfect tangency is impossible to maintain over a period of months since the cartridge changes compliance with use and the stylus changes shape with wear. These changes occur long before they can be seen on even a high-resolution optical microscope, let alone under a magnifying glass. Temperature and humidity will also affect cartridge compliance from one day to the next, and therefore also the sound quality. SLTs do definitely eliminate some sources of distortion. Perhaps their greatest advantage is the shortness of the arm tube. Shorter arms offer a better combination of low mass and high rigidity, with less arm resonance. Pivoting arms must generally be about 9 inches from stylus to pivot point, whereas an SLT arm need be only about 6 inches, which is the radius of the record. Another and perhaps stronger advantage is that, unlike pivoting arms, SLTs are not subject to skating force since they move in line with the cartridge across the record. So the cantilever can, in principle, stay neutrally in its correct alignment to both groove and generator. This may account for the SLT’s often superior stereo imaging and lesser distortion. Transmitting resonances away from the stylus, an important factor usually accomplished by good bearing rigidity, can be very difficult to achieve on an SLT. Unlike pivoting arms, SLTs’ bearing design is often “noncaptive,” meaning not enclosed. If the arm rides on top of rails, only the downward force of gravity is counteracting the upward force of the vibrations traveling from the stylus along the arm tube and up through the plinth and arm base to rattle the bearings. With the bearings not enclosed, the arm can move both up and down vertically on the rails and also back and forth on the rails and therefore along the groove, which will distort the time domain of the music. However, the air bearing used on the ET, as well as the WTA pivoting-arm no-bearing design, have demonstrated that there are excel lent possible alternatives to conventional solid-bearing rigidity. There just need to be more of them developed. In contrast to the above benefits (fully realizable only in an ideal world) is the real-world complicating factor in SLTs—the entire arm moves and the movements of the front and back ends must be perfectly synchronized. The cartridge end is driven by the record groove and the back end must remain absolutely synchronous. Any error here will throw the stylus out of alignment with the groove walls, negating the primary advantage of SLTs. There are two basic ways of moving the SLT arm base along with the front: the self-aligning and servo-driven methods. Self-aligning arms are mounted on a low-friction bearing, as in the Souther, or, in the case of the Eminent Technology, on an air bearing. Whenever the arm moves away from exact right-angle alignment to this bearing, the drag of the stylus in the record groove provides the entire motive force of the arm and pulls the arm base back into correct alignment. Servo-driven arms employ a more complex and less satisfactory method. Used on all mass-fi linear arms, this is a poor solution. The arm base is actively driven across the radius of the record by a servo- controlled motor that moves it in sync with the cartridge. This would be fine—if records could be cut with a uniform groove spacing; but this could happen only if music had no pitch. If groove size and spacing were always even, then the motor could run at a constant speed and the movement of both the back end and the stylus end would always be matched. BUT!—music varies substantially in both pitch and amplitude, so groove size and spacing vary enormously—in soft passages the grooves are small and packed closely together, whereas in louder sections the grooves are larger and more spaced out. Just examine a record surface— you can clearly see this. Sensors must detect when the front of the arm, driven by the groove modulations, is not at right angles to the base; the servomotor then reacts to bring the arm base into correct alignment. The base is moved along in quick spurts: One moment it lags behind the stylus, the next it jumps a little ahead of the stylus, then it waits until the stylus catches up, and so on. Stylus and base are never in perfect sync and so stylus/groove tangency is never quite correct. Some detractors describe servos as in effect ensuring that stylus / base alignment, and therefore groove tangency, is always wrong! And this is the fact—it’s only the very error itself that triggers the corrective action. An additional problem is that the motor inevitably introduces vibration. Only Goldmund so far has been able to come up with a servo SLT that manages to sound very good. So contrary to much of the advertising, whichever SLT drive method you use, it is impossible to maintain zero tracking error—both methods require an error in alignment before the arm base moves. With good design, though, SLTs can be closer to zero tracking error more of the time than are pivoting arms. However, with typical mass-market servo- controlled SLTs, tracking is no better, and is usually worse, than with a pivoting arm, and entails far greater expense and complication. The fact that SLT arms are inherently more complicated devices than pivoters is a real drawback. In fact, the enthusiasm for SLT arms exists predominantly in America and Japan, and much less in England and Europe. No SLT design has yet survived for an extended period of years, whereas the pivoting arm designs have been around for decades. Any SLT arm is going to require more frequent adjustments and tweaking than a pivoter. Unless you get one of the very few excellent SLT arms, such as the Souther or the Eminent Technology, you’re likely much better off with the more straightforward, less complicated pivoting arm, at least to begin with.